Can a humble cartridge-maker craft the perfect phono stage? In many respects you would expect companies that make cartridges to be the best placed to design a phono stage, but this is still quite a rare practice (van den Hul and Rega are notable exceptions). Dynavector is not just a cartridge maker of course, it has an electronics wing in New Zealand and used to make an amplifier with stereo-enhancing circuitry, there is also a discontinued head amplifier on its website. Its compact P-75 phono stage is now in its second generation and has something of a cult following, so we thought it time to investigate. The P75 does a couple of things rather differently to most. For a start it uses a switching power supply based around a tiny 250kHz transformer, an approach which should mean that there's no benefit in upgrading the simple DC wall-wart power supply. It's a technique that the rest of the world is catching up with for energy efficiency reasons, but one that few companies apart from Linn have worked with for some time. It's USP however, is a patented phono-enhancing circuit or PE, designed specifically to get the best from moving coil cartridges by short circuiting them with zero ohms and then taking the current rather than the voltage produced. It's a radical approach that Dynavector claims reduces distortion caused by non linearities within the magnet and results in a more linear result. For other cartridges, including moving magnets, the P75 MkII can be used in a conventional manner with a range of typical impedances and degrees of gain. These variations are accommodated with a selection of internal jumpers rather than switches, which makes things more fiddly than usual, but does keep costs down. Build quality is not elaborate, but is to a very high standard. 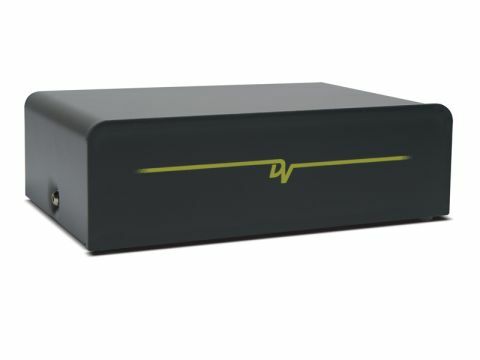 The case is steel, with an acrylic front panel and the bare minimum of socketry, the earth point has a bolt rather than a knurled nut, but DV does provide a suitable Allen key. The PCB components are all surface mount (SMD), which is rare with small audio companies and increases perceived value, something that this stage is not terribly hot on because of its diminutive stature. There is no shortage of competition at this price, but our benchmark is the Trichord Dino with its Plus power supply, which costs slightly less than the P75 but takes up more rack space with its two boxes. That stage also has easy access load and gain switching, which is a boon for reviewers but less of an issue for end users. The other contender is Tom Evans' Microgroove, which is available in three quality levels and is renowned for its dynamics, the £500 X model has adjustable impedance loading. Using this stage with a van den Hul DDT II MC cartridge proved a highly engaging, if not downright thrilling experience. The P75 emulates the character of DV cartridges with a pacey and articulate sound that draws you into the music and keeps you hanging in there listening out for the best licks and the sweetest solos. It's a slightly drier sound than the Dino, which has the edge in terms of openness and tonal depth, but has a distinct edge when it comes to perceived speed. We tried standard versus enhanced mode and found the latter gives greater tonal richness and reveals more of the acoustic space that the recording was made in. We also found that while the highest resistance setting produced the greatest output and the juiciest balance, the middle one improved the highs and the timing with them, making it the setting of choice. The balance may be on the dry side, but this helps extract sound texture and to differentiate instruments from one another – it is very easy to follow bass lines for instance. More importantly its relative lack of time smear means that it can produce a highly engaging and entertaining result with all your favourite records. The P75 MkII is a very capable and resolute phono stage for the asking price, it may not be quite as straightforward to set up and use as the best in this respect, but it's highly flexible and should work well with virtually any cartridge.